"vday" - Blog @ That Awesome Shirt! RedBubble: 15% off Sitewide Anti-VDay Sale! 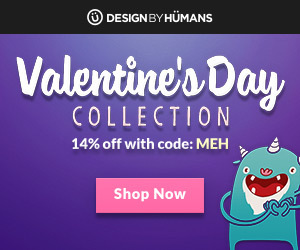 Treat Yourself with Redbubble's 15% off Sitewide Anti-VDay Sale! Only valid on the 15th of February, 2016. Buy one tee or hoodie and get one 20% off. Discount will be applied to the item of equal or lesser value. Ecludes the daily shirt and Fury fan bundles. 1 use per customer. Cannot be combined with other offers. Ends 31st of January, 2016.